Aaronovitch’s deep passionate love for London shines through in the painstaking rendering of locations on each page. An absolute gem of a graphic novel for new and old readers. 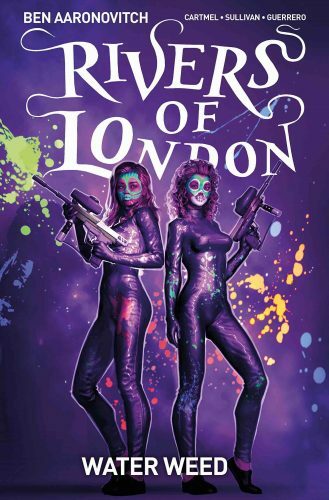 New from acclaimed British author and all around nerd Ben Aaronovitch is volume 4 of his graphic novels based of his award winning book series Rivers of London. For those who have not read his work, fear not! One doesn’t need to have read the original books to enjoy this graphic novel series. The world you are introduced to in these novels is from the perspective of London Police Constable Peter Grant, who has discovered – and as a result become part of – a special squad within the London Police department. This small fairly well kept secret group manages the magical and supernatural affairs of the United Kingdom, lead by the enigmatic “Nightingale”. This powerful magic user takes Peter as his apprentice to help keep London safe from things that go bump in the night. The comics are spread out through the continuity of the books and for those wandering about the chronology of the series, the author has provided a handy list here. A big draw for this story to the modern comic reader will be the diversity of the characters available. As a result, the comic portrays, somewhat ironically for its magical origins, a more realistic London than many other works. Aaronovitch’s deep passionate love for London shines through in the painstaking rendering of locations on each page. Therefore, one needs only be mildly familiar with London to recognise where the stories take place. The art by Lee Sullivan (best known for his work with Doctor Who comics) is a joy. Each character has clearly defined features and there is no cut and paste designs going on here. Action scenes compliment the writing (provided by British Author Andrew Cartmel of Doctor Who fame!) and the end result is a well paced and enjoyable graphic novel experience. Rivers of London – Water Weed – Graphic Novel Volume is out now! “Spring Breakers meets Lock, Stock and Two Smoking Barrels on the banks of the Thames in this new graphic novel from Ben Aaronovitch!